Scenario : You constantly get issues with your Codecs. You want to know which Codecs have been installed on your Win7 PC. Solution : I was recently facing some issues with my installed Codecs, So i tried to find out which codecs were installed on my PC. Sure, in XP it is simple, but its not so simple in Win7. Still here are all the ways to find out a list of all the Audio and Video Codecs installed on your Windows. Note : This only works for XP. a. Click the START button and find the Control Panel. b. Click on the Sounds and Audio Devices Properties icon, select the Hardware tab and highlight (click on) VIDEO CODECS. Then push Properties button and select the PROPERTIES tab to view installed codecs. c. Double-click a codec to see its corresponding properties. If a particular codec has any options that can be customized, you will see these options when you double click the codec name. Do the same thing for Audio Codecs but select AUDIO CODECS in Hardware tab. a. Go to Run and type “MSINFO32”. b. Expand the Components Link and below it, Expand Multimedia and there it is…the list of all codecs under audio and video. Do Note that this method works on Windows 7.
b. Press the ALT key to access the menus dropdown. 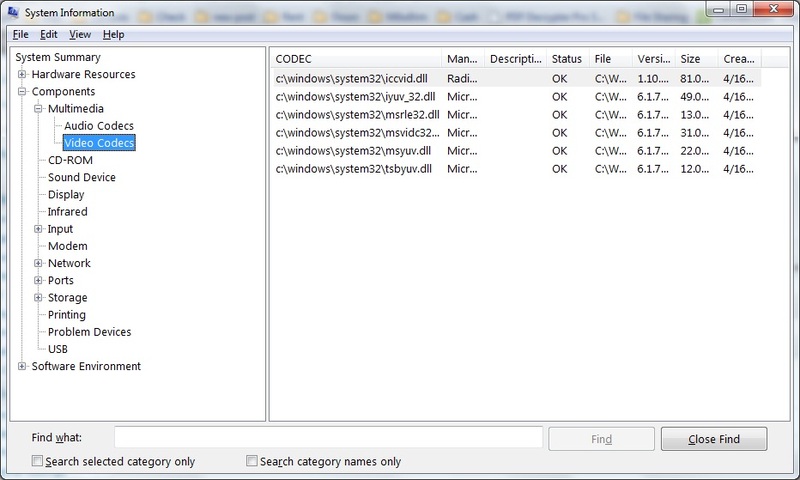 e. It will generate a browser window showing the list of codecs on your PC. That’s It! Hope this list of methods helps you. This is the first site that has properly explained how to find the codecs properly. Thanks!